...or vegan, Orthodox Jew, Muslim, or belong to some other sect of people who do not partake in the eating of pork products. Just hit up the archives and we'll get back to you later. No offense. The door is that way... sorry about the trouble. See you Monday. LET'S TALK ABOUT BACON! WAHOOOOOOOOOO! 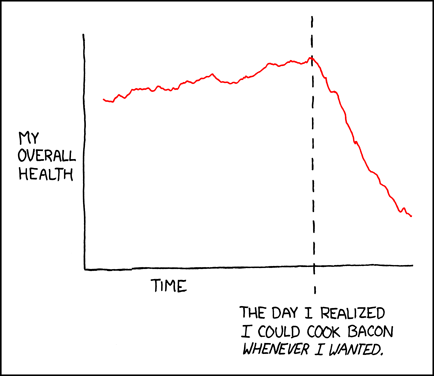 This morning, my coworker asked me, "What is up with this sudden bacon craze?" "I don't see what is so refreshing about bacon? Why would you want to brush your teeth and smell like bacon? Sure, bacon is good... but it's not exactly the nectar of the Gods. There has to be at least 300 other foods I'd rather eat besides bacon," coworker said. Woah. Woooah. Hang on right there, buddy. That's a pretty blasphemous thing to say about bacon. 300 things you would rather eat before bacon? I can understand having a few things you would rather eat before bacon... maybe tacos, sushi, eggrolls, guacamole, pumpkin pie, mint chocolate chip ice cream.... but 300!? Whhhaaaahhh? I retorted quickly with a death glare: "My list of things I'd rather eat besides bacon is not quite THAT long... there's probably only about 30 things at the most that I'd rather eat besides bacon." Okay, so my number is 30. What's yours? UPDATE: See my detailed list here. Okay, so maybe just one. However, bacon on pizza is always delicious. Hillary, How did I forget mac & cheese? What an idiot. I'm eating my 4th piece of bacon of the day as I write this comment. Nothing beats bacon in my book recently. I think I'd have to go with...two, maybe three. If you laid out 300 foods on a counter (a very long one) and I was to choose from those what I would eat before bacon, I guarantee you that I would snack on the bacon while I decided. I had a boyfriend once who asked me to carry bacon in my purse for us to snack on while we ran errands. He was kidding but I did it. Best errand running day ever. You look absolutely amazing in your new picture. That is all. hahaha! I'm not gonna lie, not a big bacon or pork fan in general, not that I don't eat it. So I might be that 300 person. Don't hate! However, a few weekend ago I did get some bacon ice cream. BOOYA! I don't like bacon, so I can think of at least 1000 things that I would rather eat!! I think 30 sounds right. After eat all sorts of sweet things, and 8 varieties of pasta, and pizza, and chocolate chip cookie dough ice cream, and soft pretzels, I'd like some bacon. So 30. I'm in agreement.